High Strangeness: Screw You, Project Stork! "This letter concerns a preliminary recommendation to ATIC on future methods of handling the problem of unidentified aerial objects. This recommendation is based on our experience to date in analyzing several thousands of reports on this subject." So begins a memorandum that could prove once and for all that the U.S. Government has been covering up what it knows about UFOs for a very, very long time. Or not. The memorandum was sent to a Mr. Gxxx from a Mr. Cxxxx, and is noteworthy in that it was making a recommendation to the Air Technical Intelligence Center, or ATIC, an office of the U.S. Air Force that was housed at Wright-Patterson Air Force Base in Dayton, OH. This is noteworthy because ATIC oversaw the activities of Project Blue Book, the Air Force's official study of the UFO phenomenon and long-time employer of Dr. J. Allen Hynek. That's what makes the memorandum noteworthy. What makes it a potential mountain of political dynamite is that it was dated January 9th, 1953. Why is that a big deal? 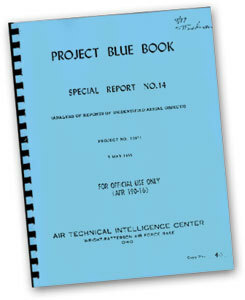 Project Blue Book was begun in 1952. It superseded Project Grudge, which was started in 1948. Project Grudge superseded Project Sign, which was begun in 1947, in direct response to the first wave of modern UFO sightings to sweep across the United States in the summer of that year. By the time the Air Force pulled the plug on Blue Book in December, 1969, the Air Force had investigated 12,618 reported UFO sightings. And yet, according to this memorandum, a completely different, unknown government group had already investigated "several thousands of reports on this subject" by the beginning of 1953! I don't know why, but I expected it to be a different color. 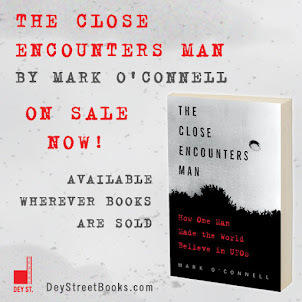 The name of the super-secret UFO study group? Project Stork. What was Project Stork (CIA)? Which cases were Project Stork (CIA) investigating? Why did Project Stork (CIA) come out of hiding to issue this memorandum to ATIC? The last question is easy. In 1952 there was a huge flap of UFO sightings over Washington, D.C., our nation's capital. People were scared shitless, the Air Force had no answers, and pressure was mounting for the government to come clean with the American people about what the hell was zipping around willy-nilly in our skies. The Washington flap of '52 forced the Air Force's hand and precipitated the highly-publicized Robertson Panel, a commission of brainy scientists that got together to look into this UFO business once and for all. The people on Project Stork (CIA) were caught unprepared and attempted with this memorandum to get ATIC to slow-walk the Robertson Panel's report until they could complete their own study. It occurs to me that "CIA" is spelled almost exactly like "CYA." But I digress. The Robertson Panel was a whitewash. It issued a report that assured Americans that UFOs did not represent a threat to our nation's security. It got the Air Force off the hook, and everyone was able to sleep at night again. Project Stork went back underground and was, apparently, never heard from again. In any case, the folks on Project Stork were thinking big. According to the memorandum, their research was stymied by a lack of physical evidence (as a crack Certified UFO Field Investigator, I feel their pain), and they aimed to fix that. Their research showed that certain parts of the country could be classified as UFO hot-spots. They reasoned that they could set these regions up as "experimental areas," and equip each of them with "observation posts with complete visual skywatch, with radar and photographic coverage, plus all other instruments necessary or helpful in obtaining positive and reliable data on everything in the air over the area." The memorandum goes on to say that, "Coverage should be so complete that any object in the air could be tracked, and information as to its altitude, velocity, size, shape, color, time of day, etc., could be recorded." Hmm... I think I see the problem. Project Stork wanted to mobilize a massive technological project in wide areas of the country to spot and track aerial objects that the Robertson Panel had just assured the American public didn't pose any security threat to the country. Awkward. Once these observation areas were fully equipped and functional, the memorandum states, "Many different types of aerial activity should be secretly and purposefully scheduled within the area." W... T... F? Project Stork was suggesting that the government send up its own secret aircraft in the observation areas! Would this be before or after the CIA slipped a truckload of LSD into the local water supply? Damn. Screw you, Project Stork! What's with this "Mr. Xxxx" stuff? Seems kind of odd and unnecessary. "The memorandum was sent to a Mr. Gxxx from a Mr. Cxxxx..."
It's quite well known in ufological circles that you're referring to Miles E. Goll and Dr. Howard C. Cross of "Pentacle Memo" infamy, as was first revealed by Dr. Jacques F. Vallee in his first volume of edited journals (1957 - 1969), "Forbidden Science." It's no mystery, after all. Except for how, in 1992, Vallee reached the conclusions he did about the 2-page letter's alleged significance, import, and meaning, which was rather overblown. The redacted names are just a little in-joke of this blog. UFOlogy as a whole takes itself a bit too seriously most of the time, so I poke fun by feigning seriousness and secrecy where none is warranted. And I agree that Vallee's response to the discovery of the "Pentacle Memo" was a bit much. It wasn't as if anyone was trying very hard to hide Battelle's involvement with Blue Book. "It wasn't as if anyone was trying very hard to hide Battelle's involvement with Blue Book." Well, actually, the Battelle Memorial Institute did try to shield its involvement in UFO analysis and research. Their contracts with ATIC/FTD, on behalf of Project Blue Book, were classified at the Secret level, and they did not want other corporate and government contractors they dealt with to look upon them as less than credible or being involved in "weird science" for reputational reasons. For example, the appendix to the Robertson Panel report, where Battelle support under Project Stork was originally mentioned, was censored out when the RP report was initially declassified. It was only several years later, with further appeals under the FOIA, that GSW and CAUS were finally able to have that one bit mentioning BMI declassified. No other part of the RP report was otherwise censored, as far as I recall. 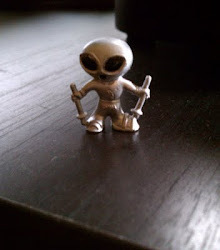 BMI also did analysis of the heated grass samples from the Desvergers "boy scout" UFO incident, and an analysis of some alleged metallic fragment of a supposed UFO, which turned out to be a prosaic, man-made alloy. BMI was the go-to civilian corporate entity with the skills, staff, and equipment to do UFO research the USAF did not have in the 1950' through the late 1960's. BMI, now Battelle Laboratories, has now grown to huge size, and manages several national laboratories. They are one of the top 10 or 15 US government contractors presently. There's a lot more about BMI's UFO government-sponsored research than has really ever been declassified or revealed, I suspect. As an example, in July of 1966, the Commander of FTD contracted with BMI to do an evaluation of the 50 UFO cases under Project White Stork (early '50's successor to Project Stork, when the convention for two-word project names for classified projects was implemented, and WS later became "Have Stork") in order to see what recommended procedural changes in PBB's methodology should be implemented. As far as I know, that BMI study did not find anything that would indicate UFOs as extraterrestrial vehicles (well, of course! ), but I do not know if the BMI study itself was ever released. I'd sure like to review a copy of it, if anyone can find it. I stand corrected! What I should have/meant to have said was that it was no secret to Hynek that he was working for Battelle. He was hired directly by BMI in 1952 to take part in Project Stork; his initial assignment was to survey astronomers to find out how many of them saw UFOs. When he consulted for Blue Book after that it was still through Battelle, as his assistant Jennie Zeidman discovered in 1954 after doing a little Nancy Drew sleuthing.